The Lake Tahoe Wildfire Summit was held in Tahoe City on June 24th, 2011, four years after the Angora fire which started on June 24th, 2007 in South Lake Tahoe. 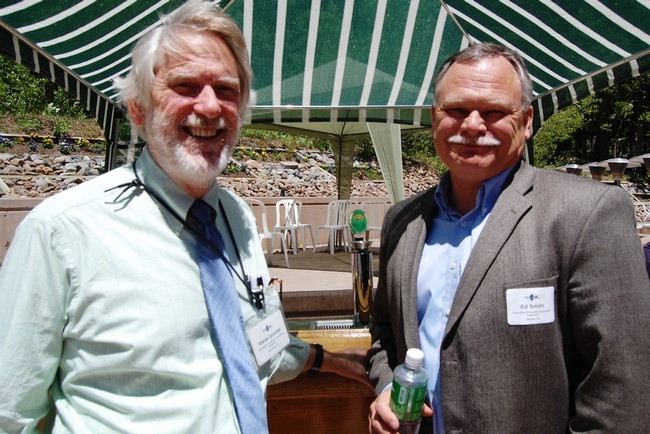 The summit drew together over 100 basin residents, agency staff and policy makers to focus on ways to reduce wildfire risks to Tahoe homes and communities. Presentations centered on wildfire issues in the Tahoe Basin and how to reduce risk to homes and communities by creating defensible space, improving building materials and design, and implementing forest fuels reduction projects. Participants also went on field trips to the nearby Washoe fire, to a forest fuels reduction project implemented at Granlibakken resort (the hosting venue), and to a nearby neighborhood to examine the flammability of home construction. After reaching a highpoint in 2007 due to the Angora fire, the level of concern about wildfire and motivation to do defensible space seems to be tapering off at the lake according to many fire agency staff. Participants cited residents’ and homeowners’ attitudes as the foremost barrier, saying that people don’t care about fire hazards, don’t think of natural vegetation as needing maintenance, or would rather recreate than do yard work. This attitude may be deeply ingrained at Lake Tahoe, a community where leisure and recreation in the “natural” outdoor environment is deeply valued. Lack of understanding about the issue and denial that a wildfire could happen again were also cited with some reporting time they had been told by locals that Tahoe had an “asbestos” forest and wouldn’t burn. Other concerns are that vegetation removal for defensible space will look unsightly or reduce privacy. Also, there is a perception that defensible space actions are illegal or clash with water quality best management practice requirements required by local and regional government to preserve Lake Tahoe’s famed clarity. Ownership patterns, including second home ownership and a high percentage of rental properties, reduce the opportunity and ability for some to complete defensible space. Costs are a factor for some residents, especially during the current recession (though there are currently rebate programs in place that can pay up to half of the cost of defensible space treatments). Disposing of materials can also be difficult. 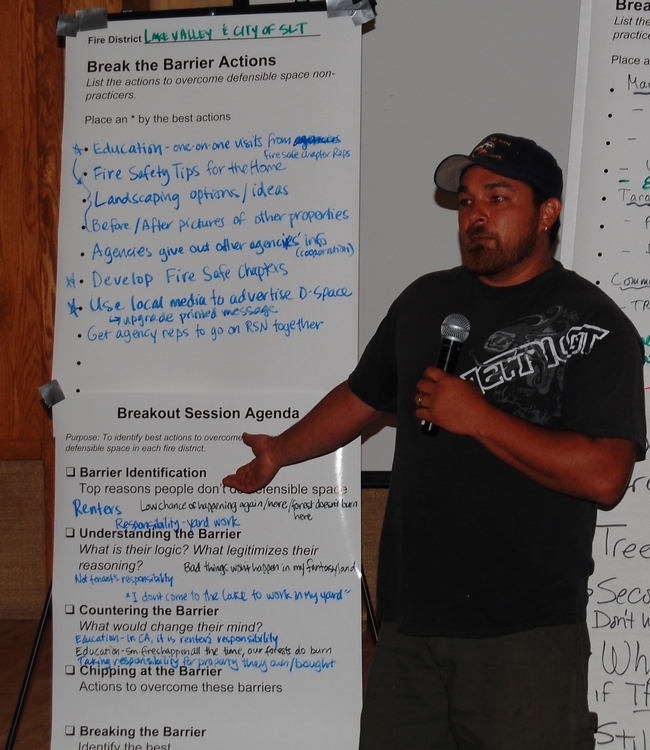 Attendees at the Summit brainstormed and prioritized strategies to overcome these barriers to defensible space implementation. Education was cites as the major need to increase implementation. Education should focus on increasing awareness and understanding of the fire issue at Tahoe and highlighting the attractiveness of defensible landscapes. A major goal should be to develop a culture that doing defensible space is just a part of living at Lake Tahoe. Helping residents understand that defensible space is not only legal, it’s required and will eventually be enforced was also key. 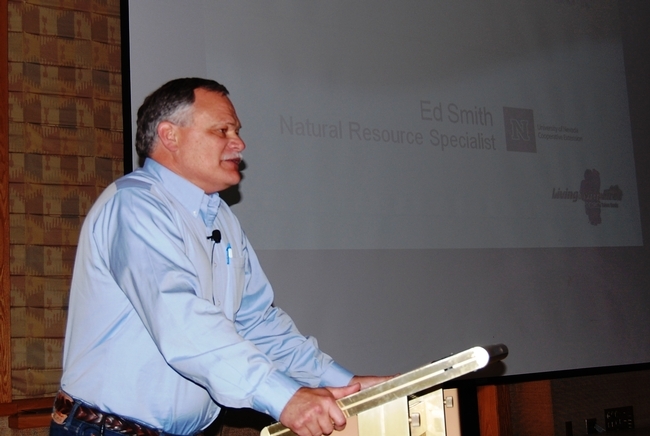 Following up with actual enforcement actions was identified as critical to this effort. At the end of the day, all participants said the summit helped to clarify wildfire issues in the Tahoe Basin. 88% said it will help their communities work together to reduce wildfire risk and that they personally had a better idea of how to reduce wildfire hazards in their community. 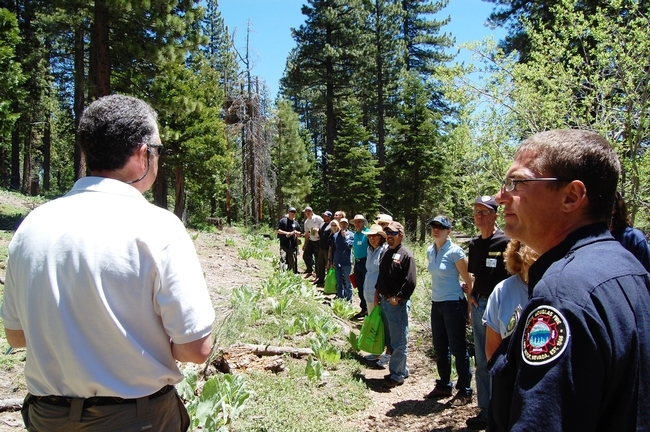 Partner agencies included the seven local fire agencies in the basin, CalFire, the Nevada Division of Forestry (NDF), the Tahoe Regional Planning Agency (TRPA), the US Forest Service and both the University of California and University of Nevada Cooperative Extension. Funding for the event was provided by the NDF, TRPA, fire resistant construction material manufactures, and local defensible space contractors.